St. Mary's Church (Norwegian: Mariakirken i Oslo) was a medieval church located in Oslo, Norway. The church ruins are located in Middelalderparken near the neighborhood of Sørenga in the borough of Gamlebyen. St. Mary's Church had been built of stone in stages with final additions made in the 14th century. A major remodeling in the 1200s gave the church a new Gothic choir. Major rebuild in the 1300s added two large towers to the west and a new and large cruciform choir. It was the royal chapel and had an important political role, as its provost from 1314 also was Chancellor of Norway. 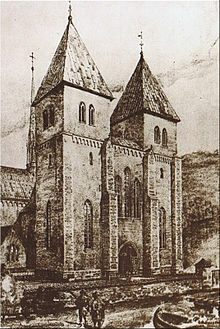 The church was set on fire in connection with the Swedish war of independence from the Kalmar union in 1523. In the aftermath of the Protestant Reformation, it was so dilapidated that it could not be repaired and was demolished in 1542. Excavations were first conducted in 1867 by Nicolay Nicolaysen under the direction of Gerhard Fischer and later in the 1960s under the leadership of Håkon Christie. Traces of an older wooden structure were discovered which were dated by Håkon Christie to around the year 1050. Remains of two people, deemed to be King Haakon V and his Queen consort Euphemia of Rügen, were discovered during excavations of the ruins of the church and re-interred in the Royal Mausoleum in Akershus Castle. ^ Sverre Bagge (1975). "Kanslerembedet og Mariakirken i Oslo". Oslo: Universitetsforlaget. Archived from the original on 18 May 2014. Retrieved 15 August 2016. ^ Henriksen, Petter, ed. (2007). "Gamlebyen – boligstrøk i Oslo". Store norske leksikon (in Norwegian). Oslo: Kunnskapsforlaget. Archived from the original on 3 June 2011. Retrieved 24 October 2009. ^ Jørgen H. Jensenius. "Mariakirken". Stavkirke.info. Archived from the original on 9 March 2016. Retrieved 1 September 2016. Wikimedia Commons has media related to Mariakirken, Oslo. This article about a church or other Christian place of worship in Oslo, Norway is a stub. You can help Wikipedia by expanding it. This page was last edited on 18 October 2018, at 09:09 (UTC).